I stumbled upon Fetchnotes this morning while looking through the Google Play store, which is actually pretty handy for finding new applications. Simply put, Fetchnotes is a simple note taking application insipired by Twitter that looks to keep everything short and sweet. After signing up for the service you’re ready to go, just swipe to the right to access the note screen and give your note a hashtag to categorize it. When you’re done with your note just swipe back to the left and bam, it’s saved. You can search notes by their hashtags when you start to build up a longer list. Where Fetchnotes looks to shine though is being everywhere at the same time. They have desktop applications for Windows, Mac and even Ubuntu. The application on the desktop is simple like the mobile application. Just add in your note and hashtag and hit save. Once you log-in it will sync the note with your phone. They even have a browser based version of it as well. 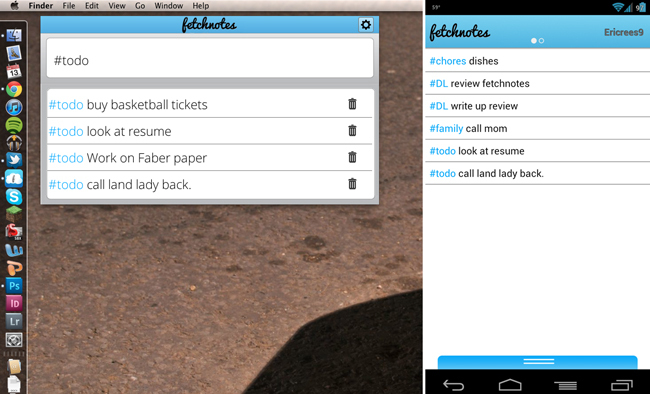 Fetchnotes wants to be wherever you are and is doing a pretty good job of it. The application just launched today so there is still some work to be done; one notable nit-pick is that syncing takes a few minutes. The application runs quite smoothly though and definitely seems to be Android 4.0 inspired. Fetchnotes definitely has some potential, hit the Play link below for a download.